"An old family recipe from Bohemia for pickled pig's feet cooked with ham hock, onion, vinegar and spices." 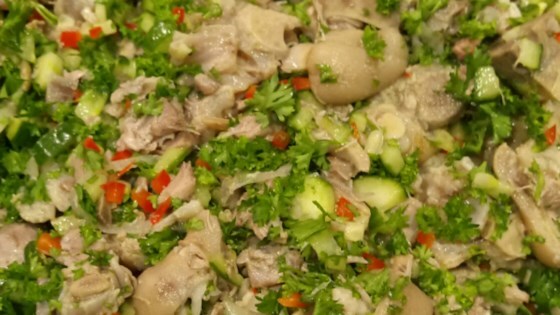 Place the pig's feet in a large pot with the ham hock, bay leaves, salt, chile peppers, and onion. Cover with cold water. Bring to a boil, reduce heat, and simmer 1 hour, or until meat is easily removed from the bone. Remove from heat, and set aside to cool. Remove pieces of pork from the liquid, reserving liquid in a separate container. Remove skin and most of the fat from the pork. Separate feet into pieces, and remove the meat from the ham hock. Discard ham hock bone, fat, and skin. Place the feet and meaty bits in a 1-quart jar with a lid. Strain the liquid, and pour over meat, leaving room for the vinegar. Stir in the vinegar. Seal jar, and let stand in refrigerator overnight. Skim off the cooled layer of fat from the top before eating.